Standing on the top of the hill, I watch my neighbour turn fields of stubble into rich, rolling acres of dark chocolate once more. 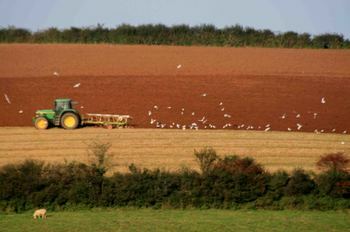 Gulls mob his tractor in a huge white cloud taking advantage of an easy meal. As I walk on with the dogs to check the sheep a lazy wind blows across the fields. Too lazy to make it’s way around, it goes straight through me with an icy lick. In the past few weeks we’ve had some golden, glowing, autumn days but now the sky has turned slate grey. The valley seems suddenly to be hunkering down and preparing for the swift decent into winter.